Tetracyclines are widely used in the treatment of periodontal diseases. They are a group of antibiotics produced naturally from certain species of Streptomyces or semi synthetically derived. There are a few case reports in the dental literature on chemical burns induced due to aspirin; hydrogen peroxide; sodium hypochlorite; silver nitrate. But no case is reported on oral mucosal chemical injury induced by tetracycline hydrochloride. 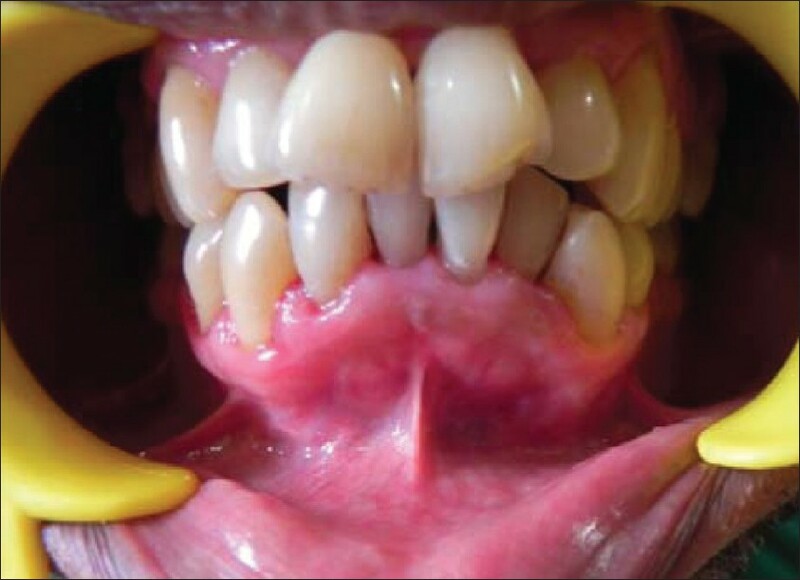 The purpose of this case report was to illustrate the destructive nature of the self-inflicted mucogingival chemical burn and to describe its successful management. A male patient aged 65 years reported to the Department of Periodontics, K. V. G Dental college and Hospital, Sullia, on September 29, 2011 complaining of bleeding and swollen upper and lower gums with pain since six months. On clinical examination, the gingiva was red in color, soft, and edematous in consistency with spontaneous bleeding on probing. The size of the gingiva was enlarged with severe calculus deposit and probing pocket depth measuring 6 mm with exudation on digital pressure. Routine intraoral photographs were taken [Figure 1]. The patient's oral hygiene was poor with no significant history of medication. The case was diagnosed as Generalized Chronic Periodontitis. The patient was advised to rinse his mouth with chlorhexidine 0.12% mouth wash and was advised to carry out the following hematological investigation like fasting blood sugar, bleeding time, clotting time, differential count, and total count. The test was advised prior to the treatment so as to rule out any systemic condition and patient was advised to report to the department for the necessary periodontal treatment next day. In this case, self-inflicted injury resulted in mucogingival chemical burn. This is due to the placement of tetracycline hydrochloride 250 mg in direct contact with the soft tissue due to misconception by the patient, believing that placement of medicine in direct proximity with the tissue will result rapid pain relief. In the oral cavity, chemical substances cause diffuse erosive lesions ranging from simple desquamation (slough of mucosa) to complete obliteration of the oral mucosa with extension past the basement membrane into the submucosa. In this patient, the intraoral examination revealed severe gingival and mucosal burn with diffuse sloughing of the lower anterior mucosa extending from canine to canine. A detailed and accurate history is often critical in the diagnosis of traumatic injuries. The challenge is to elicit relevant information from the patient. Patient may be unaware of the significance of the potentially injurious habits, practices, or agents. Permanent removal of the agent will be sufficient for the removal of the cause. Symptomatic therapy is limited to topical or systemic analgesics. In asymptomatic cases, patient reassurance may be all that is needed. The present report illustrates that tetracycline hydrochloride 250 mg placed in close proximity to tissue lead to severe caustic burns of the oral mucosa in that area. In this particular case, acidic pH of tetracycline hydrochloride might have caused extensive tissue damage, which was managed effectively using saline and betadine irrigation, chlorhexidine gluconate 0.12% mouth rinse, and systemic analgesics. The early detection by the patient and the immediate institution of therapeutic measures ensured a rapid relief and possibly prevented further mucosal damage. In addition, we believe that guidance and proper counseling before prescribing any drug, its method of ingestion should be explained to the patient. This will prove to be an important prophylactic tool in preventing from these local self-inflicting injuries. 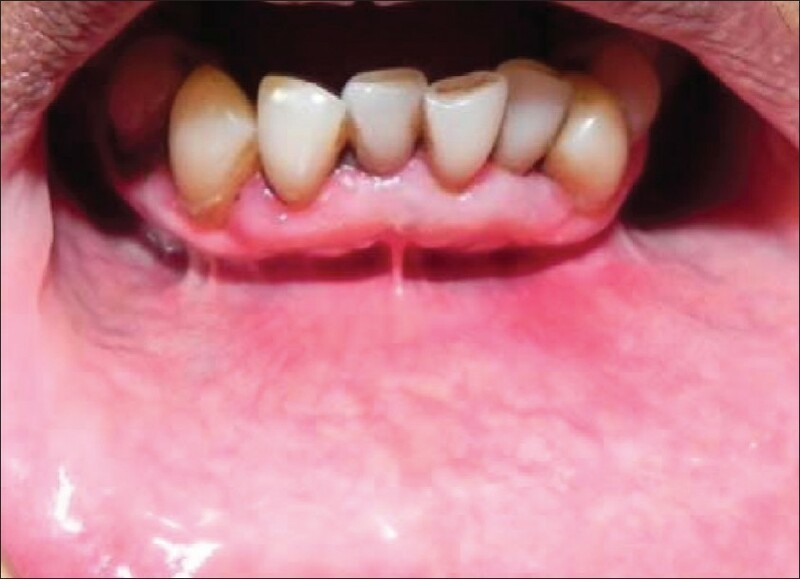 This article illustrates a rare case of "tetracycline hydrochloride burn" in the oral cavity. This case presents oral soft tissue burn caused by inappropriate use of tetracycline hydrochloride prescribed by overzealous physician. 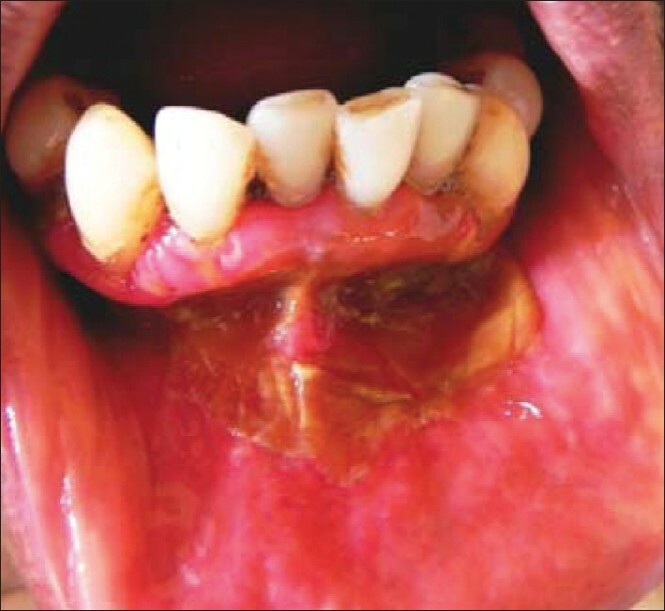 This case highlights one more differential diagnosis in considering mucosal burn in the oral cavity if the burn is not found to be associated with other commonly caused chemical agents. This lesion share clinical features of aspirin burn and hydrogen peroxide burn. From this case report, it is evident that casual prescriptions are rampant amongst physicians, even the case would have been treated by scaling and root planing. Awareness regarding the adverse effects or interactions of these medications is also important along with knowledge of their beneficial effects. 1. Armitage GC. Development of a classification system for periodontal diseases and condition. Ann Periodontol 1999;4:1-6. 2. Rawal SY. Traumatic lesion of the Gingiva: A case series. J Periodontol 2004;75:762-9. 3. Ozcelik O, Hayatac MC, Akkaya M. Iatrogenic trauma to oral tissues. J Periodontol 2005;76:1793-7. 4. Witton R, Brennan PA. Severe tissue damage and neurological deficit following extravasation of sodium hypochlorite solution during routine endodontic treatment. Br Dent J 2005;198:749-50. 5. Newman M, Takei H, Klokkevold P, Carranza F. Carranza's Clinical Periodontology, 10th ed, Philadelphia: WB Saundus Co; 2006.p.802-3. 6. Laskaris G, Scully C. Periodontal Manifestation of local and systemic diseases. color atlas and text. Beelin: Springer; 2003. p. 63- 72. 7. Baruchen AM, Lusteg JP, Nahileili O. Burns of the oral mucosa.Report of 6 cases. J Craniomaxillofac Surg 1991;19:94-6. 8. Flartz CM. Chemical burn of labial mucosa and gingival. Am J Dent 2001;4:259-60. 9. Neville BW. Oral and Maxillofacial Pathology. Philadephia: WB.Saunders; 2002. p. 255-61. 10. Middleton CE, Berwick JE, Adamson DN. Chemical burn in the oral cavity. US Army Med Dep J 1995;8:10-2. 11. Bagga, Thomas BS, Bhat M. Garlic burn as self-inflicted mucosal injury-a case report and review of literature. Quintessence Int 2008;39:491-4. 12. 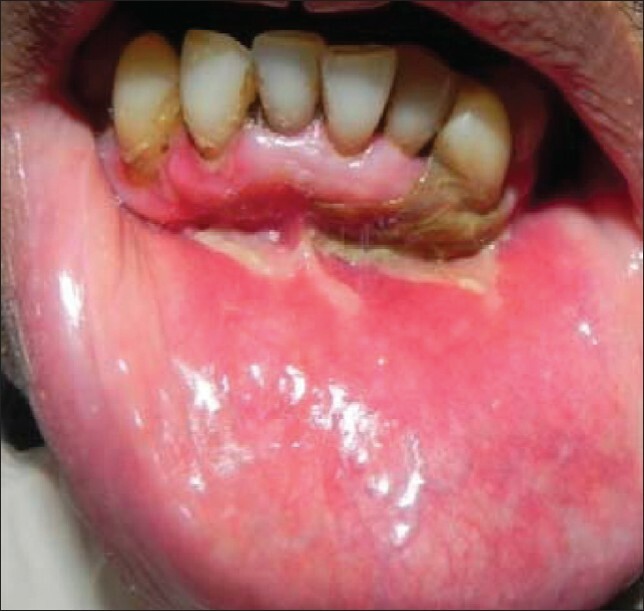 Frost DE, Barkmeier WW, Abrams H. Apthous ulcer-A treatment complication-report of a case. Oral Surg Oral Med Oral Pathol 1978;45:863-9. 13. Gatot A, Arbelle J, Leiberman A, Yanai-Inbar I. Effects of sodium hypochlorite on soft tissue after its inadvertent irrigation beyond the root apex. J Endo 1991;17:573-4. 14. Touyz. A fruit mouthwash chemical burn. Oral Surg Oral Med Oral Pathol 1984;18:290-2. 15. Yano K, Hata Y, Matsuka. Effects of washing with a neutralising agent on a alkaline skin injuries in an experimental model. Burns 1994;20:36-9. Rallan, M. and Malhotra, G. and Rallan, N.S. and Mayall, S.